In a textbook example of blooming where you are planted, Long Island mom Lisa Mladinich is quietly building a successful second career by sharing what she has learned about passing the Catholic faith on to future generations. It’s hard to avoid the suspicion that she must have been a child prodigy in her first career. 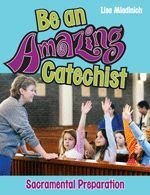 Her follow-up to last year’s “Be an Amazing Catechist” will be of considerable help to anyone who has ever tried to stare down a roomful of fifth-graders, or get teenagers thinking of Confirmation as something other than a checkoff item on the wish lists of well-meaning but clueless parents. The original entry in this series was a pep talk and field guide to amazing (in the sense of “memorable” and “effective”) catechesis. With that as context, this year’s booklet tackles sacramental preparation. On first perusing the new work, I thought that Our Sunday Visitor had not done Mladinich any favors by marketing her material behind a title page besmirched by a Sixties-themed typeface that is equal parts purple haze and avocado green on a field of – wait for it — turquoise. An alternate cover swaps the avocado green for magenta. But after reading the booklet (Amazon.com calls it a “single-issue magazine”), I have decided that even if the production staff at Our Sunday Visitor is colorblind, they were right to reach for a hippie-themed title font, because Catholic Christianity is inherently countercultural by virtue of being supra-cultural. Mladinich understands that. Whether the publisher’s choice of title font can support such scrutiny matters much less than what Mladinich has written, and that is solidly grounded indeed. Even what I thought was a failure to list favorite web sites like NewAdvent.com and CatholicLane.com among the “excellent resources for better understanding the Church’s teachings” on page 5 turned out to be a defensible choice. Although the sidebar there lists just a few sites, Mladinich sprinkled web site addresses (in software-speak, “URLs”) all over the place. Consequently, her 32-page booklet punches above its weight, and that’s a good thing. Mladinich’s writing is accessible and sometimes winsome without losing any of the nuance that is often necessary for discussing questions of religious faith. Her two pages on lesson planning are a case in point. If I may paraphrase the wisdom there by distilling it down to one sentence, Mladinich says that catechists should take risks and touch hearts, but only after having learned something about the correlation between age and attention span, figuring out how to lovingly discipline children, and finding an experienced mentor. If that sounds like a daunting bill of fare, be of good cheer. 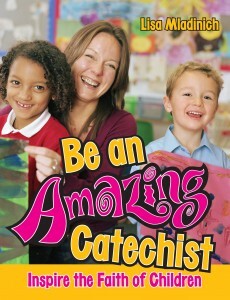 On page 12, Mladinich offers an acronym to help anyone become an amazing catechist. Rigorous adherence to the six principles that it summarizes will almost certainly light the best kind of (spiritual) fire under your charges. Each of the sacraments of initiation gets its own section in the booklet, but don’t be snookered by a sloppy reference on the publisher’s web site that calls this a guide to teaching all seven sacraments. If you’re preparing for marriage, moving toward ordination to the priesthood, or on the verge of death, you’re beyond the scope of what is written here. Appropriately enough, the section on First Holy Communion is twice as long as any other, and Mladinich suggests building reverence for the Eucharist on the memory of meals past, because “children recognize love in the offering of good food.” This is common sense, of course, but it is also what we too seldom leverage without prodding from the kinds of people who write booklets about sacramental preparation. Another teaching tool that Mladinich commends to our attention is a weekly letter to parents that summarizes what their children have learned in catechesis, complete with relevant quotations from Scripture. This sort of thing pays huge dividends, because unlike most homework, it can empower whole families. My favorite section is “Go Team,” where Mladinich tells her readers that we should proudly help teens develop a Catholic identity. Any abdication of leadership there is a failure we can ill afford. It’s serious stuff, to be sure, but Mladinich is characteristically sunny in summarizing what she means as “teaching teens that they can be great.” Neither they nor we have to settle for mediocrity. The bottom line should by now be obvious: order this booklet for yourself, and then add extra copies to your order, because you’re bound to have Catholic friends who would benefit from the advice here. If you are a Director of Religious Education, then you should be writing a “thank you” note to Lisa Mladinich. Her collection of tips for teaching about the sacraments of initiation is no “Summa Theologica” and nothing like The Interior Castle. It won’t be a hit among Christian denominations that have let sacramental vocabulary wither because their theological biases leave them running on fumes after cursory discussions of baptism and “the Lord’s Supper.” On the other hand, and provided it doesn’t get lost among old bulletins or junk mail delivered to the rectory, this booklet is extraordinarily well positioned to become the most practical item in the makeshift library that every parish and its brother seems to have.